Send the sweetest things of all this season with the Chocolate Forever Gift Set. 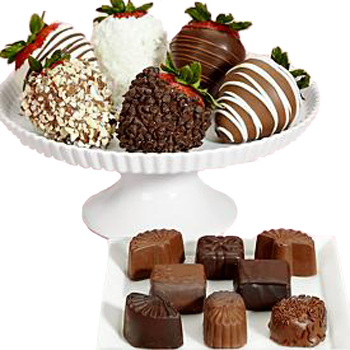 An assortment of our most tantalizing Chocolate Confections are paired with a half dozen colossal Chocolate Dipped Strawberries to create a mouth-watering collection. Perfect for birthdays, romantic occasions, or office gatherings, these sweet treats won't last, so order more than one.